For most people the sight of daffodils, with their bright sunshine-yellow heads cheerfully nodding in the breeze, is a sign that Spring has finally arrived; as A A Milne succinctly proclaimed in his poem Daffodowndilly: “Winter is dead”. The wild daffodil, often referred to as the Lent lily due to the time when it flowers, is smaller than the garden cultivars, but when seen flowering en masse, is a sight which lifts the spirit. 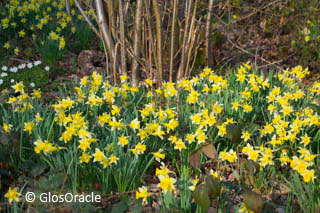 Wild daffodils flower from around mid-March through to April, but the flowering period is always weather dependent. Or swarthy-red, the colour of old brick. In the 1930s the Great Western Railway used to put on special day trips from London to Ledbury and Newent called the ‘Daffodil Specials’ for people to come and admire and pick the daffodils. However, after the War, the daffodils were all but eradicated from their meadow habitat due to modern agricultural practices, leaving them more or less confined to woodlands and hedgerows. 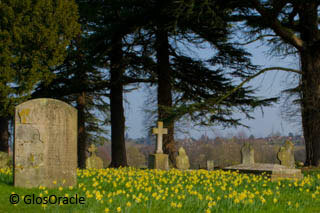 The Daffodil Way is a popular way to enjoy the wild daffodils in the Golden Triangle. It is a circular route of ten miles, along public rights of way, which takes you through meadows, orchards and woods. 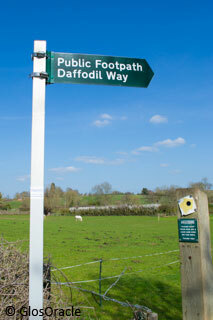 A Daffodil Way map can usually be purchased from shops in the area as well as Dymock church. It helpfully marks out the short cuts you can take if you can’t manage the whole walk. Enjoy the spectacle, but please remember it is now illegal to pick the wild daffodils. An interesting version of the Daffodil Way has been superimposed onto a 1903 OS map by Kempley Tardis. For walkers of the Daffodil Way, tea, coffee and homemade cakes are available in Dymock church every day 1100 - 1600 hours from Friday 1 March to Friday 5th April 2013, except the 20 and 21 March, when they will be in the Village Hall. Managed by Gloucestershire Wildlife Trust (GWT), this ancient wood is a Site of Special Scientific Interest (SSSI) and part of Dymock Woods. Other wild flowers to see here are wood anemones, primroses and bluebells as well as plenty of wildlife. Located at Four Oakes, near Oxenhall, Gloucestershire. Click for map. 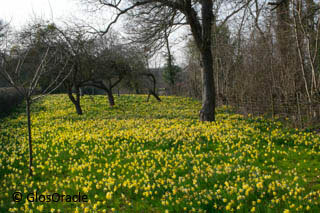 These are two of Gloucestershire's finest daffodil meadows, named after the owners who donated them to the GWT. 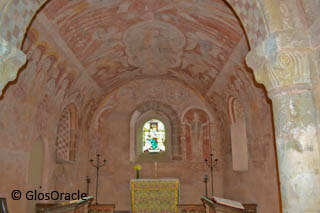 It is believed they were once created from roadside common land where the owners would have grown fruit and vegetables. When the cottages were demolished and cultivation ceased, daffodils and other ancient woodland wild flowers spread from the Greenaways wood-bank. The Reserve contains a number of interesting old varieties of fruit trees, including Ellison's Orange apples and Red Longdon cider pears. GWT requests visitors view this nature reserve from the gates to prevent damage to the wild flowers. Located near Oxenhall, Gloucestershire. Click for map. Another fine example of wild daffodil meadows that were once a common sight in this part of Gloucestershire and is now managed by GWT. Located half a mile east of Dymock, it is on the route of one of The Dymock Poets' Paths. Click for map. This small, steep sandy bank, was acquired by GWT in 2010 who removed lots of scrub and bracken that had threatened to take over the site. Also on one of The Dymock Poets' Paths, located between Redmarley and Dymock. Click for map. Woods and meadows managed by Gloucestershire Wildlife Trust may be visited at any time (subject to their conditions), but there are three daffodil weekends organised by the villages of Dymock, Oxenhall and Kempley, when there are organised walks, as well as maps of the local areas showing routes and sites of interest, so that you can walk at your own pace if you wish. 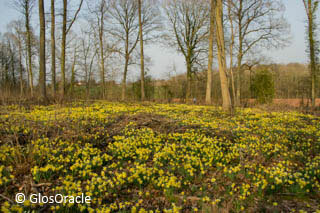 Enjoy one of the guided walks to see the wild daffodils. Walks leave at 1400 hours on Saturday (2 mile walk); 1430 on Saturday (1 mile walk with child friendly focus) and at 1400 hours on Sunday (2 mile walk). Alternatively, you can get at map from the Village Hall and walk at your own pace. Refreshments served in the Village Hall on both days. Location: Four Oaks, Oxenhall, Gloucestershire GL18 1LU. Click here for details. 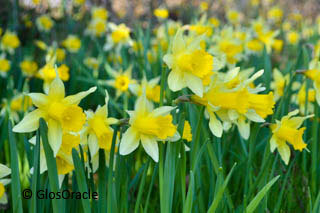 Guided walks to see the wild daffodils at 2.30pm each day which last approximately on hour. A map is available for those who want to explore at their own pace. Spring fayre in the Parish Hall, as well as refreshments, 1200 to 1700 hours. Click for details. There is a permanent exhibition in Dymock church giving information about the Dymock Poets who lived in the area just before the First World War: Lascelles Abercombie, Rupert Brook, John Drinkwater, Robert Frost, Wilfred Wilson Gibson and Edward Thomas. More information on the Dymock Poets can be found on website of the Friends of the Dymock Poets. A Poets' Path map is also available on their website.